This calculator estimates the loan people with poor credit can obtain, as well as an approximate monthly payment for that loan. Simply input your desired vehicle’s purchase price, the down payment you plan to provide, and your trade-in allowance. Follow this up with the interest rate attached to your prospective purchase and the loan term in months. When you click on CALCULATE, you’ll see the estimated amount of your loan and the monthly payment attached to that loan. There is no shortage of reasons why modern adults might find themselves in a weak financial position these days. Of course, the most current reasons are the economic downturn, the resultant job loss, and ongoing unemployment. But even before the Great Recession, plenty of people succumbed to the mindset of keeping up with the Joneses, living well beyond their means and landing in a situation where living paycheck to paycheck became the norm. It's not all that surprising when you consider the tenets of capitalism - we have all embraced the idea of private ownership. But unfortunately, most of us continue to spend more than we actually earn. And it's made all the easier by the growing use of credit, which allows us to make purchases based on anticipated earnings and then pay them back later. The problem is that many adults treat credit as cash rather than the loan it is. In turn, they end up in an endless cycle of repayment, thanks to the addition of interest charges. At the same time, they continue to spend instead of paying off existing debts in full. So where does this leave you when you find yourself in need of a car? In a terrible position, that's where. The vast majority of consumers don't have the cash on hand to purchase a vehicle outright. This means you need to finance your purchase, and that requires a good credit rating to get loan approval. 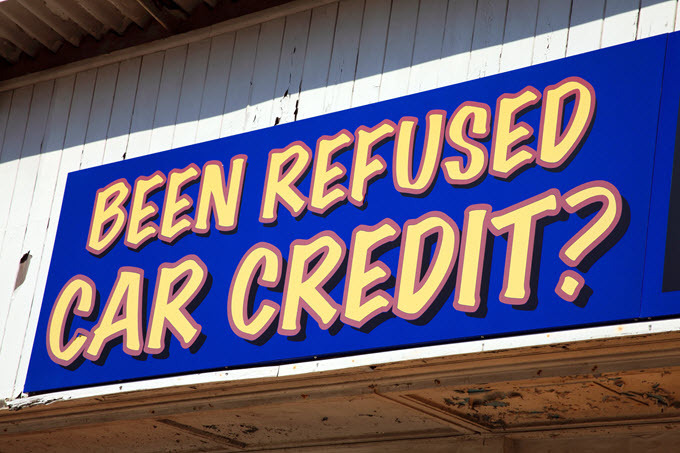 So what can you do when your car breaks down and you need a replacement but your credit score simply isn't up to snuff? Here is some advice to help you along. It's important to set realistic goals when it comes to buying a new or used car with limited resources. You might be drawn to brand new, luxury vehicles, but you can't buy caviar on a peanut butter budget - that's what got you into trouble in the first place. What you need is reliable transportation that won't do more harm to your finances. So tear your eyes away from the latest BMW or Mercedes and look to economy class vehicles that you might actually be able to afford. Or better yet, consider purchasing a used car in the interim while you work on paying down other debts and improving your score. If you're planning to pay for your vehicle purchase with a loan of some sort, despite your dismal economic outlook, there's just no getting around the fact that you're going to face higher interest rates than the average consumer. You have to understand that lenders are taking a risk by giving money to someone who is already fiscally overburdened and has a history of late or missed payments and/or outstanding debt. The trade-off for taking that risk is excessive interest, resulting in a higher overall payout. Luckily, there are ways to lower the rate. For instance, you could provide a sizeable down payment. Credit reporting agencies are notoriously inaccurate, so it's important to get a copy of your report so you can see exactly what's going on. At the very least, you can get a look at your score, but your report will also inform you about the black marks dragging your numbers down. What you may discover is that debts you settled are still listed on your financial report. You might have to call the lessors you've paid off in order to have them report in on your progress, potentially improving your score in the process. At the very least, you can use this report to prove credit history, which can actually help you secure funding for your car purchase (or at least better rates) over someone with no history of debt and repayment. And of course, this is the first step toward understanding your financial situation and curing your credit woes. You can get a free copy of your report at AnnualCreditReport.com. When your credit rating is high, securing a favorable loan is no problem. Not only will dealerships offer to pay for your vehicle purchase, but you can probably secure the funding you want at a great interest rate by visiting any number of lenders in search of pre-approval. The same cannot be said of those seeking a car loan when facing monetary troubles. If you want someone to lend you the capital needed for your purchase, and you also want to avoid digging yourself deeper into debt, you're going to have to prepare to do some homework. Comparison shopping for loans can be a tedious undertaking, but it is necessary if you want to secure the funding you need, as well as decent terms for your loan. There are certainly car lots and lenders that cater to subprime candidates (i.e. those facing fiscal hardship). But you might want to steer clear of such options unless you really have no other choice. The reason is that these organizations know they have you over a barrel. If you're unable to get a loan by traditional means and you're in dire need of a vehicle, they can get away with charging you an exorbitant rate of interest for the privilege of getting a loan and a vehicle. Some of them also install remote starter interrupt devices. True, they are taking a pretty big risk, but you're going to end up paying for it. So seek out alternatives. Peer to peer lending sites like LendingClub or Prosper may offer more compelling rates. The more money you can put down when seeking a new or used car, the less you're going to have to borrow - that's just common sense. And there are a variety of ways to scrape together some cash on short notice. You could, for example, sell off items of value on eBay or through a local consignment store. Or you could host a garage sale. You could take on a second job temporarily. Even a few hundred dollars more down could help when taking out a loan for a car. However, you may also want to hit up family members for loans. Unlike banks and other lenders, your family might be more lenient when it comes to loaning you money, especially when they see you're in need. In fact, you may be able to finance your purchase entirely with personal loans. Just make sure to create contracts for repayment with your loved ones. They'll likely cut you some slack when it comes to terms (due dates, interest rates, payment amounts, etc.). But unless you want to risk your personal relationships, you need to structure your payment plan and stick to it as you would any other loan. If you own a home, you might have more money on tap than you know, especially if you've built up considerable equity. And if your home has increased in value while interest rates have decreased, you should think about refinancing anyway, totally independent of purchasing a car. Of course, your need for transportation is the matter at hand. And when you refi or get a home equity loan, you could free up some cash in your monthly budget, at the very least. Or you may be able to withdraw cash in the amount needed to purchase a new car. It all depends on the circumstances surrounding your home. This won't help you in any immediate sense where your vehicle purchase is concerned, but if your financial troubles are bad enough that you can't get a car loan, then it's time to seriously rethink the way you deal with money. With your credit report in hand, you can begin the process of paying down debt and removing black marks. So the next time you find yourself in need of a new car, you'll be more than prepared to secure the favorable funding you desire.